This holiday - the last holiday I will have at my present school - has been a time of coming to terms with what I have - and have not - achieved during my time here in Switzerland. What I've come to realize is that it's all the things that I haven't done that are the hardest for me to leave - all the dreams I had, all the things that so obviously needed to be changed in order to truly prepare students for their futures in the 21st century, all the opportunities that have been missed. I'm a hard worker and a good teacher. Three years ago the thought of moving to a school that needed a lot of work wasn't daunting to me at all because I had already seen how technology could improve learning and I'd already been part of implementing those changes at previous international schools. How enthusiastic I was when I first arrived in this beautiful country, how much I wanted to do - and how sad I am to reflect on the way the enthusiasm got knocked out of me. This is why I'm counting the days. And yet I'm not one of those teachers who having made the decision to leave or who having found another job, wants to just coast along to the end of the year. At times I get eaten up by the multitude of things that can still be done, the small improvements that can be made, the support that teachers still so need. My own inner voice is saying to me "keep going, don't let this experience turn you into a bad teacher or a bad person, don't give up yet, there are still 10 weeks left, you can still make every day count." So instead of counting the days, let's instead try to reflect on some of the days that have already counted and how I have grown as a learner and become a better teacher. The SAMR Model: In March 2010 I went to Prague during the Easter holidays and attended the Apple World Leadership Summit. While I was there I heard an amazing presentation by Stephanie Hamilton of Apple about the SAMR model that was developed by Dr Ruben Puentedura. This presentation and the one that followed it by Jenny Little of Munich International School, gave me the language to describe how technology can transform learning. Many schools, including my current one, were viewing technology as something that "enhanced" the curriculum either as a substitute or support for something that was already being done or as a way of giving a small, functional improvement. What was needed was a move towards "transformation", using technology to redefine the learning. On my return to school I was so enthusiastic about the SAMR approach that I drew up an IT vision for the next 3 years incorporating plans for shifting from S to R. This plan included a vision for teaching and learning, professional development and staffing, based on my reading of the FutureLab report, the UK National Curriculum and the ISTE NETS standards which I tried to match with the PYP transdisciplinary skills. Although this plan has never been officially adopted, and although I still hear technology being referred to as a tool or a skill, the SAMR model has continued to influence the conversations I've had with teachers over the past 2 years, as I have tried to encourage them to move from viewing technology as an enhancement to viewing it as a transformation. Individual teachers and some grades have certainly made this shift. Motivation: A couple of months after attending the Apple summit in Prague, I was lucky enough to get the opportunity to travel with one of our administrators to Munich over the Ascension Day weekend which meant that we could drive there without taking time off school. While there I participated in the Evolving Schools for a Whole New Mind Conference with Daniel Pink. This was inspirational for me in a number of ways (and I later went on to read further about motivation in Dan's books as well as the recently read book Punished by Rewards by Alfie Kohn) as I came to understand the forces that motivate me are autonomy - the desire to be self-directed - and challenge - the personal satisfaction of having a purpose, getting better at something and making a contribution. As I have thought about why teachers become demotivated and demoralized as a result of being micromanaged, I've returned to these books for inspiration and when considering a new position autonomy and challenge were what I was looking for. Techie Breakies and the Tech Train: I'm passionate about PD and I'm passionate about sharing this PD with others. During my time here I've tried many different models of giving IT PD to our teachers, from Techie Breakie sessions before school started, to Tech Train sessions at lunchtimes and after school. For some reason it seemed easier to do this in my first year here - the past couple of years have seen very limited time for this sort of training as lunchtimes and after school have been taken up with duties and clubs. To balance this trend I've spent more time with individual teachers, helping them to progress at their own pace and I've started a weekly blog where I share apps, videos, links to online PD and so on so that teachers can access these at their own pace and time. Individual support over the past couple of years has been successful in encouraging teachers to develop their class and individual blogs and in encouraging them to reach out to other educators worldwide for both their own PD and for participating in international collaborative projects with their students. Google Teacher Academy: What can I say except Wow! During the summer holidays following my first year in Switzerland I attended the GTA in London. This was the first time Google had held such an Academy outside of the USA and of the 50 participants 25 were from the UK and 25 from the rest of the world. I can't even begin to describe what an honor it was to be selected for this or how much impact this has had on me (and also, I think, on everyone else who participated - many of us have gone on to new jobs since). I returned to school in my second year rejuvenated and keen to get Google Apps for Education into school. Although there was an initial hesitation from those who believed cloud computing would fail (yes, really! ), we started with a pilot with Grades 4 and 5 and a new Learning Platform, and it just mushroomed from there. Who on earth would ever want to go back to Word and other network based applications on the school computers when they realized the power of Google Apps for collaboration and access anytime, anywhere? I think most students and teachers were hooked from the very first lesson when it was introduced. ICT in the PYP: During my second year I was lucky enough to be invited by the IBO to attend a meeting in Hong Kong where the role of ICT in the PYP was being discussed. What an amazing 3 days of work we had! On my return to school I sat down with the curriculum documents I'd drawn up the previous year and rewrote every single one of them based on the new ICT strands. Again this gave me a language to use with teachers, along with the SAMR model, when discussing how technology can support students during their inquiries. I've been enthusiastic about these strands and have loved sharing the learning journey I've been on with other teachers at the ECIS IT Conference in Frankfurt and the ECIS Regional Conference in Lisbon. Workshop Leader Training and Making the PYP Happen workshop: For a number of years I've been interested in becoming a PYP workshop leader, but the timing has never been right as you have to commit to staying 2 years in your region after training. When I first thought of becoming a workshop leader I was working in Amsterdam, but knew I was moving to Thailand within the next couple of years, therefore I didn't apply. In Thailand when I wanted to become a workshop leader we'd already made the decision as a family to move back to Europe when our son graduated. Finally I got to do this training in my second year here and it was great - I wish I'd been given the time to run more workshops since completing this training as I will leave the region again having only done one regional workshop. But what a great workshop it was! I was lucky enough to do this workshop with our school's PYP coordinator who is an experienced workshop leader and which meant that the planning for the workshop was easy for us to arrange. I loved doing the workshop itself - it was such an affirming experience. So now I come back to the quote from Steve Jobs. Despite all the positive achievements I feel I've made, I'm counting the days because the positives have been bright lights in what has otherwise been a fairly soul-destroying experience that at one time brought me to the edge of giving up teaching altogether. Thankfully there is a happy ending and I am following my heart to a more dynamic place. But before that there is still so much to do - so I'm making every day count. 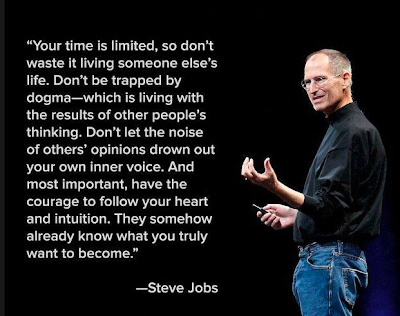 When I read the quote by Steve Jobs I immediately began to relate it to some of the voices I have been hearing around me lately. Since returning from a restful spring break I feel like many of my colleagues have moved on to thinking about next year already to (in my opinion) the detriment of this year's students. It is easy to get caught up in that tide and follow that lead. Instead I will try to remain a "committed sardine" (a phrase from one of your previous posts that has stuck with me) and continue to live in this moment, following my intuition, because I feel that I owe it to myself and my current kids. I plan on making every remaining day count too, Maggie. Thanks for posting. I enjoy following you. If we are looking at statistics Maggie, I think the results of the survey the other day were a reflection of all that you have done in Primary School and empowered the teachers you work with to achieve. Thanks Rebecca, I agree. It was amazing for me to hear that the highest percentage of tech use at the Expansion level for the entire school was in Upper Primary and even when I look at the statistics for Lower Primary I can see it has the highest percentage for the Integration level. I am really pleased that the technology audit validates all the work we have been doing over the past 3 years in supporting teachers and helping them to move forward with their students. And all this despite that fact that for most of this time I've been working way below the capacity that I know I'm truly capable of. As I said in the post, the hardest thing for me is leaving knowing all the things that it hasn't been possible for me to do - and the fact that at the end of the day it's the students that have missed out when we as a school have not taken advantages of all the amazing opportunities there are these days to use technology to transform their learning.